Crystal Instruments (CI) is a leading USA based manufacturer of systems and software for machine monitoring, dynamic measurement, vibration testing, and acoustic testing. CI’s products are used for machine diagnosis, design verification, product testing and process improvement by manufacturers of all types of electronic and mechanical products. The head office is located in the heart of Silicon Valley in Santa Clara, CA with manufacturing facilities located locally in San Jose, CA. The Spider front-ends have voltage, IEPE and charge inputs which are ideal for shock, vibration, and acoustic measurement, strain or general purpose voltage measurement. The internal flash memory stores test configuration data for controlling up to hundreds of channels simultaneously and stores realtime analysis data. Multiple output channels provide various signal output waveforms that are synchronized with the input sampling rate. Ten monitoring connections on each unit are used to read analog input and output signals. 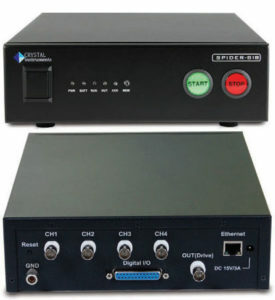 There is a built-in isolated digital I/O to interface with other hardware. Our scalable architecture allows users to employ as many as 512 input channels for the utmost spatial resolution. Sampling to102.4 kHz provides excellent time resolution while spectra with up to 12,800 lines may be controlled. Data is stored into 4 GB of internal flash memory. Increased storage space is possible with the addition of a 250 GB external unit. The Spider-81 is the flagship model; all other Crystal Instruments controllers have evolved from it. This 4th generation hardware is highly modular, distributed and scalable. Each Spider-81 has 8 analogue input and 4 analogue output channels. Analogue monitoring channels serve an attached oscilloscope. Eight digital I/O pairs are provided for custom applications. The Spider-81 features a bright front panel LCD that displays system status and test information. Real-time status such as control RMS or sweeping frequency is instantly viewed on the LCD. The Spider-81 does not just use Ethernet for data communication, it employs IEEE 1588v2 time-synchronised Ethernet connectivity. This technology allows (100 meter!) 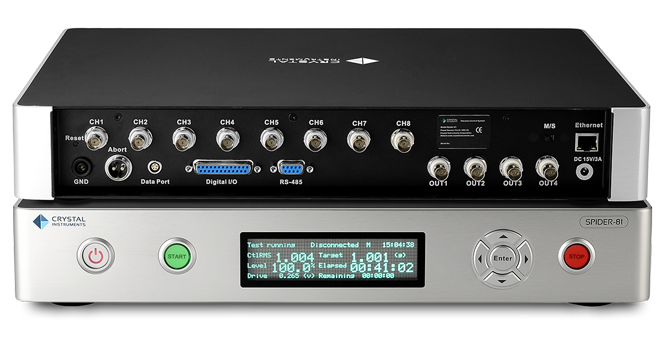 remote input modules to be connected solely by Ethernet (no dedicated “sync” cable required), yet still provides sampling and triggering synchronised within the accuracy of 50 ns. 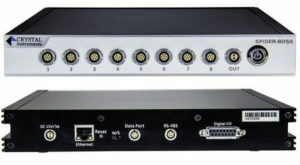 The Spider-80X front-ends and the Spider-HUB industrial Ethernet switch may be used to expand the Spider-81 controller up to 512 input channels. All input channels across the system are amplitude matched within 0.1 dB and phase matched within 1° over a 20 kHz bandwidth. All Spider front-ends contain a 4 GB flash memory for the storage of data and test processing instructions. If longer recording is required, the Spider-NAS (Network Attached Storage) provides 250 GB of solid state disk (SSD) storage in a removable SATA cartridge. 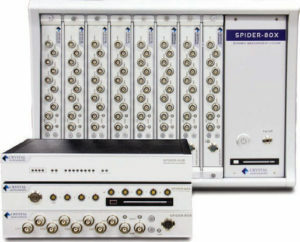 One Spider-NAS records streamed time waveforms and spectra from up to eight Spider front-ends at the speed of 102.4 kHz per channel. 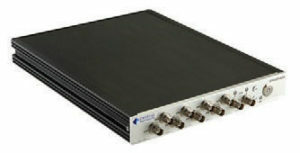 The rapid transfer rate allows continuous recording of all channels at a measurement front-end’s highest sample rate. Multiple Spider-81 front-ends and the Spider-80X front-ends can integrate to construct a higher channel system. The Spider-81B front-ends is not expandable by design. The Spider-81B front-end is a smaller, simplified systemfeaturing 4 input channels and 1 output. This system provides everything needed to run Sine, Random or Shock tests measuring the control and up to 3 monitor signals. The Spider-81B has 4 pairs of DIO. This basic system actually provides a very comprehensive facility with the same control quality, safety assurance, measurement precision, expandability and human interface that distinguish all Crystal Instruments controllers. The Spider-81B is ideal for educational institutions and small R&D laboratories. The Spider-80X, a compact package, is designed for application in three fields: dynamic data acquisition, vibration control, and machine monitoring. It features eight analog input channels and two channels that may be software selected as analog outputs for vibration control or tachometer inputs for the analysis of rotating machinery. A single Spider-80X frontend is a complete two-output controller with the same high quality patented dual ADC input technology as the Spider-81 series. The Spider-80X inputs provide absolute/differential and AC / DC / IEPE coupling choices; charge mode is an available option. 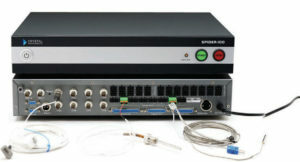 The Spider-80X provides the same time sync Ethernet connectivity and 4 GB flash memory for data and program storage. Multiple Spider-80X front-ends may be linked together using the (eight-into-one) Spider-HUB module and storage can be increased to 250 GB by adding a Spider-NAS mass storage module. Like the Spider-80X, multiple chassis combine to create a system up to 512 channels, all sampled simultaneously. A dedicated massive storage hard disk (a solid state hard-drive with a capacity of 250GB) allows the time signals of all input channels to record at up to 102.4 kHz/channel. Accurate time synchronization results in excellent phase match in the frequency domain between all channels, either on the same Spider front-end or across different front-ends. Real time FFT, octave, order tracking or vibration control functions can be enabled. The modular boards of the Spider-80Xi are installed at the factory and are not onsite swappable. The Spider-80Xi system consisting of the 64 channel chassis is powered by AC power, at 100 to 240 VAC. The Spider-80Xi system consisting of the 32 channel chassis is powered by the DC power, at 10V to 22V. The latter is also easily operable with an external battery pack. 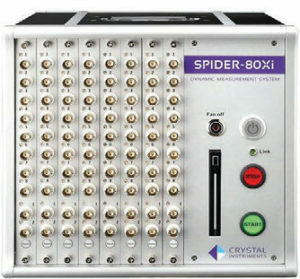 With the Spider-Battery, (developed by Crystal Instruments) a 32 channel Spider-80Xi system operates up to 4 hours without interruption. New! Users now can now insert three front-end cards (Spider-80Xi-P08; Spider-80SGi-P08; Spider-80Ti-P08) making this the only multi-channel count system that allows such multiple connections. Target at all VCS, Modal and DSA application. Modular at box level. Compact version of Spider-80X. Target at all VCS, Modal and DSA application. Modular at PCB board level. 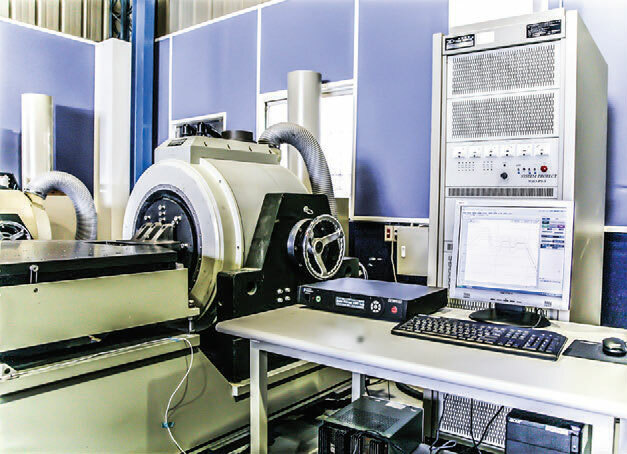 The Spider-100 is specifically designed to perform all types of tests where the DUT is subjected to simultaneous vibration, temperature cycling, and variable humidity, including Highly Accelerated Stress Screening (HASS) and Highly Accelerated Life Testing (HALT). The Spider-100 controls temperature, humidity, and vibration harmoniously in a chamber and shaker system, which includes external heating/cooling and humidification/dehumidification systems. The communication between numerous devices is optimized by the Spider-100 in an integrated design to achieve high control accuracy. The Spider-100 provides eight input channels and two shaker drive outputs for linear shaker control. When a pneumatic hammer table is used, the controller commands the RMS vibration level via its 4-20 mA current-loop output to the table’s pressure control valve. There is a total eight 4-20 mA analog out channels offered on the Spider-100. Additionally, the Spider-100 provides ten 4-20 mA analog input channels for humidity sensors and eight temperature input channels for 3-wire RTD or K-type thermocouples. Thirty relay control channels control the heaters, valves, and fans of the chamber. Thirty-two channels of programmable digital I/O are available for user-defined applications. The Spider-80SG is a front-end in the Spider-80X family. It can be used for strain measurement and many other type of sensors that require external power. VCS software fully supports the Spider-80SG front-end in all its testing types. Named for their networkable ability, the Spider series as well as the Spider-80SG share the flexibility of scaling up in channel count and functionality. Users can easily couple multiple Spider-80SG front-ends together or combine them with the Spider-80X dynamic signal analyzer or the Spider-81 vibration controller. Fully integrated, simultaneous strain measurement with any VCS and DSA tests. The Crystal Instruments vibration control system (VCS) software is designed for a wide range of vibration and shock testing customers. The same software suites support from as few as two inputs up to 512 input channels with multiple drive output capability. Software solutions for vibration control include Sine, Resonance Search Track & Dwell (RSTD), Oscillator, Random, Sine-on-Ransom (SoR), Random-on- Random (RoR), Swept Random-on-Random (SRoR), Classical Shock, Transient, Seismic, Shock Response Spectrum (SRS) Synthesis, Time Waveform Replication, Highly Accelerated Life-Testing/Stress-Screening (HALT/HASS) and multi-drive control. These suites facilitate testing to virtually all current environmental test standards. Customizable report templates allow the user to generate reports in XML, OpenOffice, PDF or Microsoft Word with a single click. With the Application Programming Interface (API), Crystal Instruments’ controller can be directly accessed from LabView, Matlab or other customized software. Spider front-ends run on Linux, iOS, and Windows operating systems. 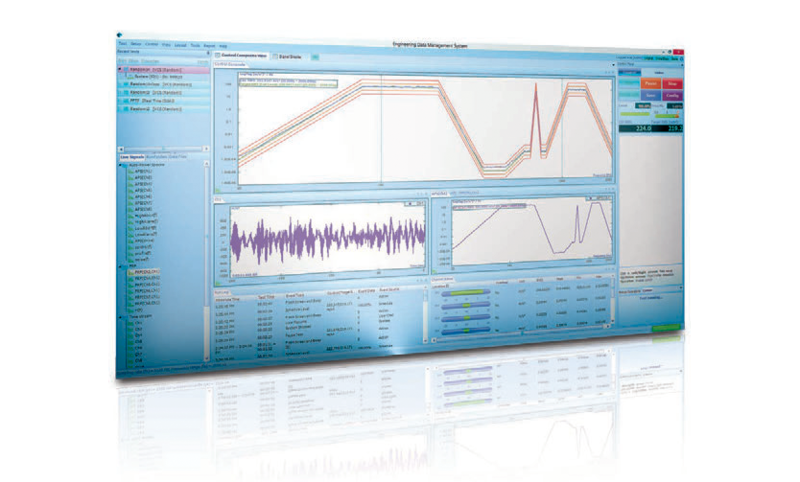 The VCS software also supports a wide range of dynamic data acquisition and real time processing functions including Fast Fourier Transform (FFT), Frequency Response Function (FRF), real-time filters, octave and sound level meters, order tracking, automated limit testing, transducer calibration and more. Our Engineering Data Management (EDM) software comes with each system. 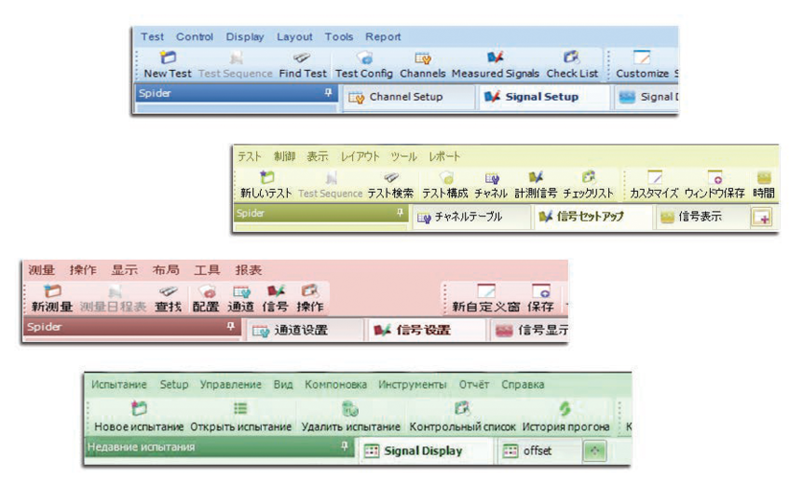 EDM provides a common user interface for both VCS and Dynamic Signal Analysis (DSA) applications. A single interface with the same look and feel means that test specifications can be transferred from engineering to production without change or error and test data can be compared directly between one system and another. EDM provides a consistent user interface regardless of the application and independent of the number of hardware channels. EDM (Engineering Data Management) is available in English, Japanese, Simplified Chinese, Traditional Chinese, and Russian.